Rising to be one of the top three global shows of the industry in recent years, AWE continues to advance the integration of traditional home appliance industry and emerging sectors with the faith of creating value for consumers, promoting multi-level communications between capital, science and technology, industry, distribution channels and consumers. For more than a decade, it sets a stage for enterprises throughout the home appliance industry chain, consumers, media and investors, and provides channels for industries from home appliances, consumer electronics, smart home, IoT, artificial intelligence, to mobile communication, and even real estates. Housing nearly 900 exhibitors, the forthcoming AWE 2019 is ready to deliver new trends and changes for the industry at the 135,000 square meter exhibition area in Shanghai New International Expo Center from March 14th to 17th 2019. Embracing more than 300,000 visitors, it will showcase the new concepts and innovative products of sectors spanning kitchen and bathroom appliances, consumer electronics, life appliances, smart appliances, heating and ventilation products, white goods and parts and components, allowing exhibitors, distributors, consumers and entrepreneurs to leave with a new understanding of new technologies and industry trends. Meanwhile, AWE 2019 launches a pre-show survey in a bid to learn the wants and needs of visitors and provide well-targeted services on site. Take an insight into global trends in China. While traditional home appliances and consumer electronics have deeply changed our daily lives, the Internet, big data and artificial intelligence take it to the next level by adding rich imagination to it. Based on what we learn from the exhibitors, we believe AWE 2019 will establish richer, smarter life scenarios, making the show a battle ground for enterprises to compete their newest technologies, blockbuster products and services. For industry insiders, this, again, will be where they meet old friends as well as take an insight into future trends. The fertile Chinese market not only fosters the growth of strong local enterprises such as Haier, Midea, Huawei, Tencent, TCL, Hisense, Gree, Aux and Fotile, but also draws the eyes of many global giants including Bosch, Siemens, AEG, Sony, Panasonic, Whirlpool, Samsung and LG. With more world premieres at AWE and more great minds sharing their views, AWE will continue to lead the industry to develop in many ways, for example product differentiation, scientific and technological innovations and industry transformation and upgrading. As an indicator of technological trends, a runway for high-end smart appliances, and the forefront of future technologies, AWE establishes a wide array of scenarios covering smart life, smart transportation and smart entertainment under the theme of Home for Next with the aim of including users as part of this annual carnival. Technology Park, a highlight of AWE, has joined hands with Internet heavyweight including Tencent, Sinovation Ventures, Lenovo, GoPro and UBTECH, institutional investors, start-ups as well as enterprises specializing in smart transportation to offer superb experiences for visitors. Regarding TVs, display technologies and hardware innovations will be one of the highlights of AWE 2019, with laser TVs, ultra-screen TVs, and 8k TVs brought by TV makers including Japanese and Korean brands such as Sony, Samsung, Panasonic, LG, and local brands such as Skyworth, Hisense, Changhong and TCL. At AWE 2019, a number of brands will display their 8k TVs. AI TVs equipped with facial recognition, voice interaction functions will also be centerpieces of many industry leaders including Hisense, Changhong and TCL. Besides, Hisense’s laser TVs, with updated display performance and Hisense’s brand-new VIDAA AI system, provides strong all-scenario voice and image searching functions at lower cost, becoming a top replacement option for Chinese consumers. Looking back at AWE 2018, Midea put forward a new strategy called Human-machine new era to empower products with sense and judgment through big data and artificial intelligence. It focused on the display of smart washing machines and smart kitchen, rolling out a refrigerator capable of keeping food fresh for one week. At AWE 2019, artificial intelligence will continue to be a key area of exhibition for enterprises. Long committed to smart home exhibitions based on scenarios including living room, bedroom, kitchen and targeted products such as mother and baby use products, health-oriented products, Haier develops its smart refrigerators by reorganizing an eco system that integrates 400 third-party resource providers covering the seller of produce, quality inspectors, purchasers and refrigerated transportation providers, offering consumers a one-stop eco system-based smart food shopping experience. Along with the rise of China’s home appliance industry and the deepening of its global strategy, China-made products are going global as global products do. Chinese consumers develop increasingly picky needs for products from local factories as well as across the world, looking for differentiated products that assert themselves. Haier and Midea, two Chinese home appliance giants starting off as a white goods maker, are deepening their differentiation strategy, with Midea focusing on robots and global operation and Haier on smart home deployment known as “4+7+N”, meaning 4 spaces including living room, kitchen, bathroom and bedroom, 7 elements including air and water for example, and n customized solutions for consumers based on their habits. Kitchen appliance makers also deploy in differentiation with dazzling results. Built upon its 20 years of commitments in technological innovation, craftsmanship and establishment of its high-end brand, Fotile separates itself with differentiation and competitiveness, bringing its differentiated products such as built-in microwave steamer and oven combos, in-sink washing machines and constant temperature water heaters into AWE. 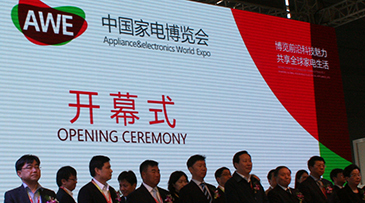 At AWE 2019, more and more enterprises are gearing up to show high-end products that combine technology with high quality, leading the global home appliance industry going high-end. As post-85s and post-90s generation become the main stream of consumers, home appliance industry faces the challenge of transformation to meet consumers’ demands for high-quality, smart, personalized, diversified products. At this point, many emerging categories become the driving force of growth. How to revitalize brands? Aux has set a great example by putting efforts in technological innovation and quality, winning the heart of consumers with its health-oriented, smart products. Gree has been devoted to the R&D of consumer electronics, communications and industrial control chips for a long time, striving to develop chips with independent intellectual property. The number of industry insiders has grown year-on-year to take 77% of visitors. To provide targeted services for them, AWE launches a pre-show survey designed for industry insiders to improve visitor experience.